Actually, I am not sure what this is so am posting on here to see if anyone recognizes the hull shape/configuration and can tell me any more about the boat. 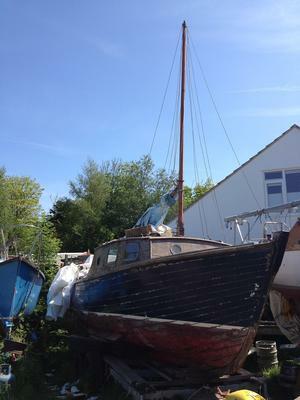 I bought it a few years back and it was at the time advertised as a 1948 23' Bemister Sloop. I would ignore the CMS, I have some sections of what I believe are the original sails - brown canvas/cotton (lots of holes). It has a Brit 2 cyl petrol 12 HP which also seems quite rare, few people have heard of them...and parts seem non-existent so I'll be replacing with Diesel, but any info would be appreciated. Comments for 1948 23' Bemister? Bemister are an old sailing family for at least a century with a fine house on the space between the Avon and Stour. 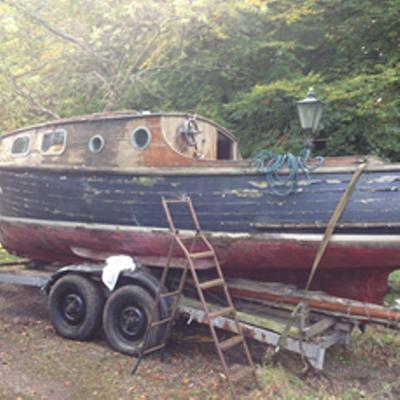 The old Mr Bemister used to own a ketch called Sarah which was sold on to the late Roger Slater of Bournemouth, a Metal Box entrepreneur and general Mr Fix things business wise. He used it mainly at anchor but I do have a rare photo somewhere. There will be knowledge of Bemister at Purbrook Rossiters or any of the old names in the harbour, Stride or Derham maybe. email me at editor@msbnews.co.uk and I will start looking if you need a photo side on to Sarah under sail at a distance from recent memory..
Been dealing with loads of pics, my mother died last month and my late also dad pal of Roger in 2013 or 4, hence pictures coming to light. It will be a "hard copy" to find but I can scan it to your email. Just be patient..been looking for other stuff and found you. Yes, Christchurch is what I remember finding on a variety of webpages....as far as a contact to send photos - please use cordell@clhensley.com. 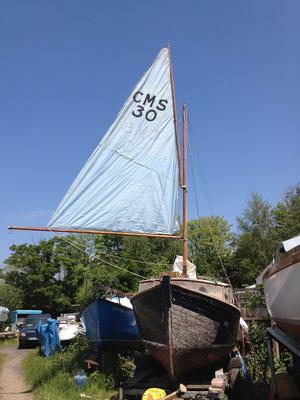 My late dad had a 24 foot GRP Snapdragon at, an improvement on his lovely wooden slipping through the water Admiralty pattern 10 foot 6 sailing dinghy from local Strides boatyard in the 50's who bought it back 30 years later. And my dad’s pal, the late dynamic Roger Slater who bought SARAH a ketch from local boat builder and celebrity of some sort, Mr Bemister, known or described as "Old Bemister;'s old boat." We ate cream cakes on board I remember at the mooring. ...there was room for the owner and a butler. Bemister, an old man in the 80's, lived on the space between the Avon and the Stour in a posh house with a drive and an anchor or other symbol of his reputed status. Roger was an ex Metal Box exec who was an entrepreneur and carried it off very well. But we sold the Mudeford Sandbank beach hut and I now live upriver on an island of sorts looking at the Avon from a British Empire colonial style bungalow, enemies might call a mobile home. And now this place is licked into shape I seek some sort of nautical return. When I was in the hut I wrote about the harbour and you can read articles about the harbour, the Strides and the beach at msbnews.co.uk. Let me know where to send the Sarah pics? My dad made wooden models of it too with its distinctive shape honed by seafarer's over centuries. It was a classic but the engine was tricky and I have seen photos of it on its side right outside the Christchurch sailing Club, which my father’s good standing was the insurance they needed. Another pal was Arthur Whitby and Bill Urry, who had a fearsome reputation for having yachts and wives aplenty. Out heritage is irreplaceable and I am happy to help in this sort of way. Tim Baber,(1956- ) father Jim Baber 1918-2013. She may have been built in Christchurch by boat builder Herbert Bemister.